Bangkok, which was originally called Bang Makok, means “City of the Wild Plum”. Why is it called that? I don’t know, but if by “plum” they mean traffic, than the name would make a lot of sense, because Bangkok is a city of wild traffic. Just like in Indonesia, scooters weave in and out of the smallest gaps in cars, and they’re either really lucky or really good at driving the scooters, because I haven’t seen any crashes so far. Maybe it’s a bit of both. Trying to cross the street? You might want to go get something at Starbucks while you’re waiting. Oh wait, Starbucks is across the street as well. You’ll find yourself waiting to cross the road for a very long time in Bangkok. But, once you do, you’ll find yourself in the middle of a large group of stalls, selling mostly food, from pad thai to popcorn to grilled chicken guts on a stick. Food is dirt cheap in Bangkok, even cheaper than Indonesia. You can get a whole meal, including a drink and dessert, for 2 or 3 bucks, depending on where you go and how good you are at haggling. 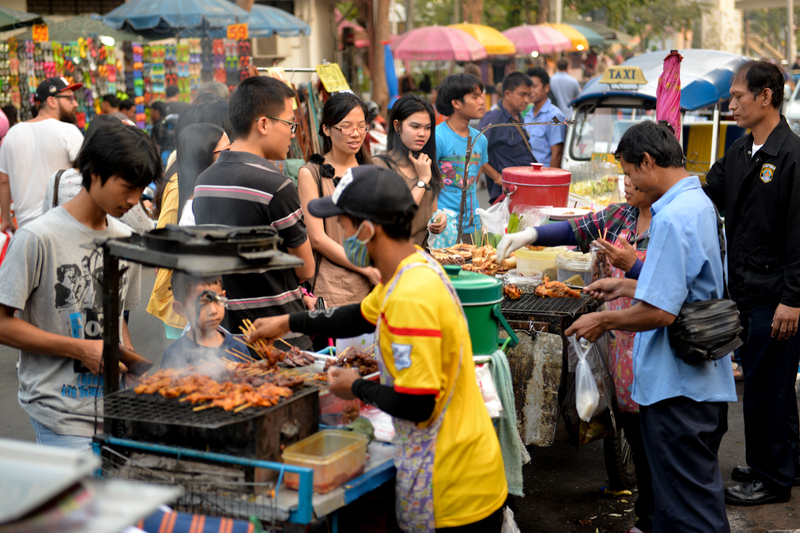 You may want food, but there are a number of markets, like the weekend market, or the floating market, that sell much more than food, like wallets, purses, sculptures, toys, phones, the list goes on. One store was selling “100 percent leather” wallets for eight dollars, which doesn’t really convince me that it was real leather. A unique market that we visited is called the floating market. Most of the shops there don’t actually float, but are on a boardwalk on the side of a canal. You rent a boat and sail through the market, stopping whenever you want to get something. One shop took hooks, grabbed our boat, and pulled it in without asking. They tried to sell us a fan that could turn into a hat, vice versa. Some of the shops though did float, and they sold everything from mangoes to small sculptures of buddha. Some shops sold things like knives or purses, and they had a small boat shop selling something like noodle soup or sticky rice. The floating market took about an hour and a half. Bangkok also has the Grand Palace, which used to be the home to the King of Bangkok, but now it is a major tourist attraction. It is a very impressive structure, with lots of intricate designs on the walls. 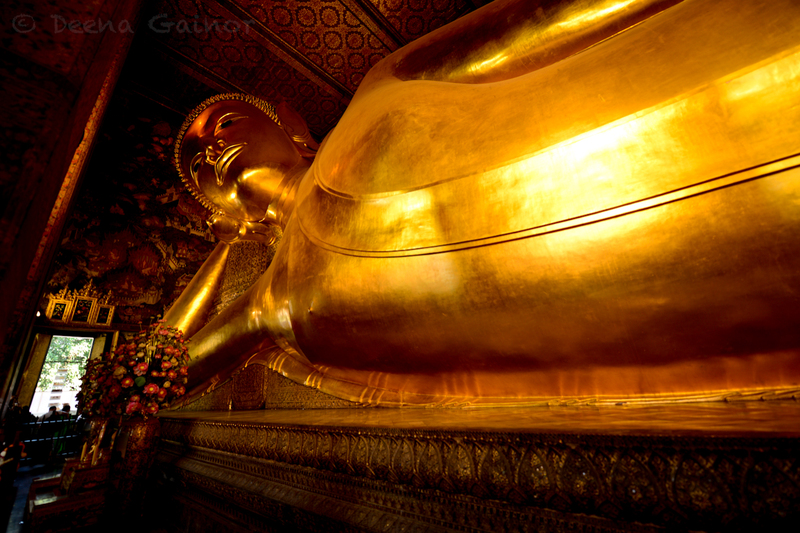 It is also home to the emerald buddha, which is a statue made entirely out of… emerald. When you visit the Grand Palace, you are required to wear pants, and a shirt that covers your shoulders. and it takes up most of the space inside. 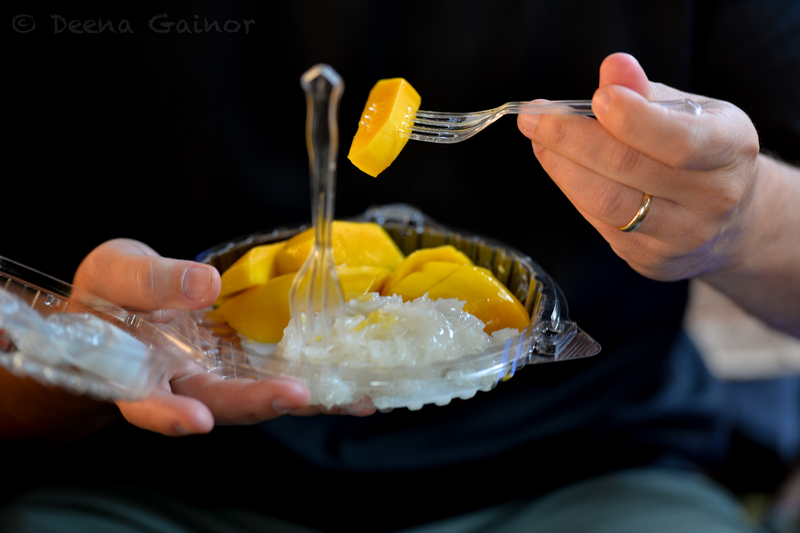 markets, and, most importantly, sticky rice and mango. It is a great place to explore Thai culture, and have fun doing it.